Sarab Deva: Summer in Berlin, The New Album and my personal creative Think Tank! Summer in Berlin, The New Album and my personal creative Think Tank! I have been in Berlin since my last blog post, enjoying the European summer, recording music with some great musicians and basically just living the dream! In August I played at the Berlin and Leipzig HoliOne Festivals and have been working with various DJ Producers to remix Uplifting Mantras for You. I have had a couple of new album ideas floating around my creative space this year. What with my travelling and meeting so many new and wonderful people, how could an artist not have some fantastical sparks of inspiration? They say that everyone has a book within them somewhere. I certainly feel like I have one or two brewing in my personal creative think tank too (I really like that term: ‘think tank’), but the books will come later. I have also started a very intensive daily meditation called the Sodarshan Chakra Kriya, which has taken me into a more relaxed and neutral headspace. One of authenticity and of self acceptance. Which brings me to the idea of how a person's own creative 'think tank' is always chocka block full of random stuff at any given time. We absorb so much data every minute of every day, which mostly is just clutter. This doesn't do the nervous system any favours and as difficult as it may be, it's a good idea to include an 'internet fast' into your weekly schedule! In order to create, one needs to clear head space! I certainly do! And that is what the Sodarshan Chakra Kriya is meant to do. It clears the subconscious mind of the junk we overload it with on a daily basis before those junkie thoughts become a part of our unconscious programming. Hence this new album due to be released this month is very different to Uplifting Mantras for You. I have been on quite a journey of learning and discovery since I begin this tour in April. This new album is about me really getting back to basics and the authenticity of my own sound and the authenticity of my personal relationship to mantra and to the Shabd Guru. "Sadhana, daily spiritual practice, is the base, the foundation of all spiritual endeavor. Sadhana is your personal, individual spiritual effort. It is the main tool you use to work on yourself to achieve the purpose of life. It can be done alone or in a group. Sadhana is whatever you do consistently to clear your own consciousness so you can relate to the infinity within you. Before you face the world each day, do yourself a favor and tune up your nervous system and attune yourself to your highest inner self. To cover all your bases, include exercise, meditation, and prayer." 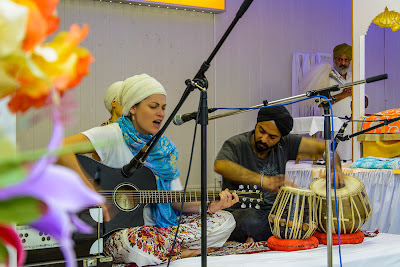 I was asked to perform one of the mantras from my new album at the Sikh Temple in Berlin last week Sunday, which was a great honour for me! Looking forward to sharing this new album with you as soon as everything is ready to be launched. I would like to say an eternal thank-you to my devoted husband Fabian-ji (Sarabdev Singh) for his undying support and love, and for always being right behind me on this journey. Siri Akaal! P.S. Next Stop is South Africa where I will be performing at the SKY Festival in Johannesburg.